I’ve returned once again from my alter-ego role as wilderness woman and found another box full of fresh CSA veggies awaiting my arrival. Help! What do I do with all this stuff? Especially when I’m off in the backcountry for days at a time. It’s not like I can haul around bags of fresh produce with me on the Colorado Trail. Plus, I’m growing some of my own herbs as well, so I have an abundance of mint, cilantro, rosemary, sage, and basil that I’m adding to everything I cook, bake, dehydrate, and drink. Anyone care for a mint julep? To sip while munching corn chips and cilantro salsa? Or cilantro guacamole? Actually, I’ve never had a mint julep, but I do love my cilantro. I’ve been adding it to everything from corn chowder in the backcountry to cornbread here at home. But before I launch into the recipe, here’s the nutritional profile of cilantro. It truly is a super food. First, let’s get things straight. 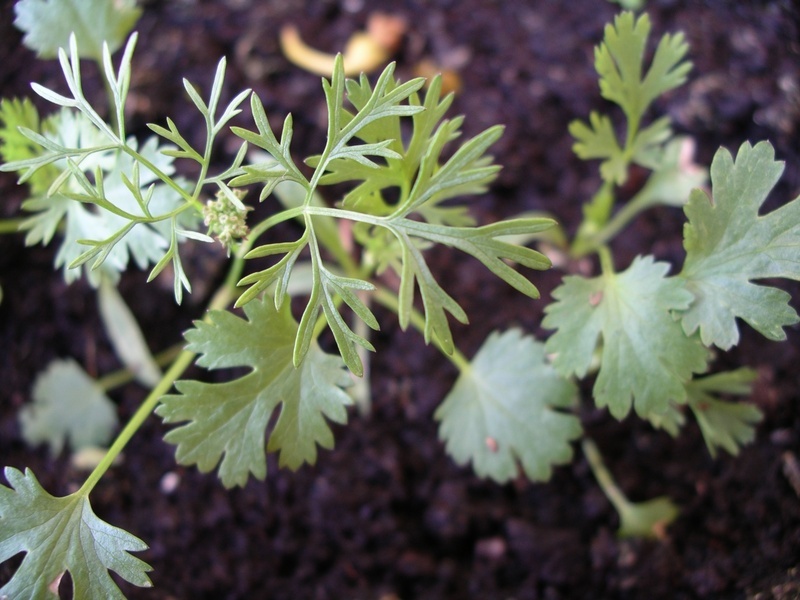 Cilantro refers to the leaves of the coriander plant. They look similar to flat leaf parsley. The seeds of the plant are ground and called coriander spice. Cilantro has a vibrantly fresh smell and it adds a distinct flavor to foods, especially southwestern fare. I love it, but apparently not everyone else does. In fact, there’s a whole website dedicated to living the anti-cilantro lifestyle. They even sell “I hate cilantro” clothing and accessories. Hmmm? Sure seems like there are better ways to spend your energy other than hand-wringing over a harmless little herb. Aaahh, but on the flipside, the Chinese believe cilantro to have aphrodisiac qualities and use it in love potions. Maybe cilantro is the secret ingredient in Love Potion # 9. The Coasters? Or The White Stripes? But I digress. I’ll blame it on too much high altitude, fresh air, and a wandering spirit. Back to cilantro and why it enjoys “super food” status. Cilantro is rich in all kinds of beneficial phytonutrients, flavonoids, detoxing substances, and antimicrobial compounds. One of which has been found to have twice the antibiotic power of the commonly used drug, gentamicin. In fact, researchers found several different antibiotic substances in fresh cilantro, suggesting its use as a potential food additive to prevent food-borne illnesses. According to other studies, cilantro was found to normalize blood sugar levels and to help stabilize lipid levels. Not to mention the fact that 2 tablespoons of fresh cilantro contains less than 1 calorie. You get a lot of bang for your buck with this little gem. I made some Mexican spoon bread last night with Bob’s Red Mill GF Corn Bread mix, cilantro, green chiles, creamed corn, and cheese, but it didn’t come out perfect. It was good, but not perfect. I need to work on it a little more before I pass the recipe off on my blogger friends. But, my friend Megan, self-described quinoa virgin, sent me this recipe today. Out of the blue. She didn’t even know I was was sitting at my computer daydreaming about how to finish this post. This was Megan’s first experience with quinoa. I guess because she’s one of those wheat eaters and hasn’t had to venture into that parallel universe of alternative grains and flours. Little did she know it was more fun over here. Thanks, Megan — you saved the day. Here it is, her personal comments and all. 1. Place quinoa in a fine mesh sieve and rinse thoroughly with cold, running water. Bring water to boil in a small pot, add the quinoa and salt and bring to a boil again. Cover and reduce heat to low for 15 minutes. Turn off the heat and keep the pot covered for an additional 5 minutes. Strain off any excess liquid and spread the quinoa out to cool on a tray while preparing the remaining ingredients. 2. Steam or lightly sauté corn until just tender and cool to room temperature. Combine all of the ingredients in a large bowl and gently toss. Season with additional salt, pepper, or hot sauce to taste. Serve with fresh lime wedges. P.S. Miles Collins, prolific chef/photographer from England, has an interesting blog post about hawaj spice blend which is absolutely wonderful and contains ground coriander (cilantro) seed. I’ve used my own version of this in chana dal and love the flavor it imparts. This entry was posted on Saturday, August 2nd, 2008 at 2:40 pm	and is filed under Gluten-Free Recipes, Nutrition Therapy, Super Foods. You can follow any responses to this entry through the RSS 2.0 feed. You can leave a response, or trackback from your own site. Thanks for that, I didn’t realise cilantro refered to the leaf rather than the seed and/or root. I grow cilantro for seed because the freshly picked and ground pods are like nothing you can ever imagine buying in your local spice store and they are much cheaper! I don’t understand why people are so against it, I find it an incredibly uplifting herb and an essential in my workplace. Great photograph,could you tell me what CSA means please, I’ve come across it before but remain ignorant. I agree, cilantro is one of my all-time favorite herbs. It’s also incredibly “detoxing” to the body. I didn’t want to over-do my nutrition notes on this little herb, but I could have gone on and on about the health benefits. “Uplifting” — that’s a great adjective for cilantro! CSA stands for Community Supported Agriculture. It’s a way of bringing people together into a relationship of support for the land, the farmers, green living, and organic farming. I bought a “membership” share in a local CSA and paid up-front early last spring for weekly produce. Once a week for 26 weeks during the harvest cycle, I pick up a box of organic veggies and a dozen farm-fresh eggs. It’s like being a shareholder in a local organic farm. I make a commitment to the farmers and they make a commitment to the shareholders. It’s so wonderful to have freshly picked (within 24 hours) goodies to play with each week! It’s a treat, that’s for sure! My CSA is Grant Family Farms if anyone is interested. If you want more information just out of curiosity, here’s the link. Thanks for explaining that. The CSA sounds like a great way to bring both producer and consumer together and I am sure young people will benefit from seeing fresh food delivered to their doorstep in its natural state. Good for you for supporting it. I’m thrilled to have the opportunity to cook with farm-fresh, organic veggies. Plus, it’s fun to be surprised each week. I love it! I had no idea my timing was so good. Imagine that…my first attempt at quinoa and I wind up on a blog. You know, ‘wheat eater’ sounds like ‘weedeater’ when you say it fast. Yes, I’m one of those but I’m still looking for smarter grains so I love your blog. Thanks for the recipe….as for mint, I am growing pineapple mint and you should try it in a mojito, it is awesome! Yes, perfect timing and your recipe was already gluten-free! Yippee! And Thank You! I love the “weedeater” comment. Very cute. Oh, and you’re only beginning to realize the abundance of “alternative” grains out there for all of us to enjoy, “weedeaters” or not. Lorna Sass has a great book about grains. It’s called “Whole Grains Every Day, Every Way.” It’s awesome! I’m definitely in the “love cilantro” camp! Glad you made it back safe and sound – put up pictures when you don’t have 500 other things to do on your list!! Good luck with the CSA this week – I’m drowning under mine this week as well! Hey Michelle – We’re off again tomorrow for another phase of our Colorado Trail journey. I’ll fill you in when I return. I gave my CSA share for this week to a friend of mine. I’m still working on last week’s bounty! I also have a fruit share starting in another couple of weeks. Can’t wait for that! I love the combo of quinoa and corn. I just made some two nights ago and added chopped tomatillos and cherry tomatoes too. I think cilantro is a remarkably versatile herb and always have some on hand. I’m slow with my responses lately, but wanted to tell you that I checked out pineapple mint and YUM! Thanks for the tip!